Over 1,000 protesters at O’Hare International Airport demand the release of travelers being detained there on Jan. 28, 2017, under President Donald Trump’s executive order banning immigrants and refugees from seven predominantly Muslim countries. In 1887, Chae Chan Ping, who had lived in California for 12 years, went to visit family in China. He carried with him a certificate of re-entry, which Congress required of all Chinese living in the United States who wished to travel abroad. The law was enacted in 1884, two years after Congress cut off new immigration of Chinese workers to the U.S. But in 1888 when Chae Chan Ping was on a ship returning to the U.S., Congress enacted another statute which barred the entry of all Chinese workers, regardless of their prior legal status and whether or not they had gotten the certificate. The rules had changed while he was in transit, just as they did for many foreign travelers this weekend – this time by a presidential executive order. By the time Chae Chan Ping arrived in San Francisco Bay, Chinese community leaders had hired lawyers and were looking for a returning resident to test the new law. Chae Chan Ping became their client in a habeas corpus action in federal court. He ultimately lost in the U.S. Supreme Court in a case that became known as the “Chinese Exclusion Case.” The court held that Congress’ “plenary power” over the admission of foreigners superceded Chae Chan Ping’s right to return, despite the law’s conflict with a treaty and the discrimination inherent in revoking his right to return to his California home. Almost 130 years after Chae Chan Ping tried to return to California, Iranians, Iraqis, Libyans, Somalis, Sudanese and Yemenis have been barred from entering the U.S. for at least 90 days. Syrians are barred indefinitely. Several hundred thousand lawful, permanent Muslim residents of this country (many with U.S. citizen family members), risk being barred from re-entry to the U.S. It does not matter whether they traveled abroad for a wedding or a funeral, for an academic conference or a beach vacation, on business or for a scientific or cultural project. More than 17,000 students from these seven countries are enrolled in U.S. colleges and universities, whose potential exclusion has already roused the ire of the presidents and faculties of dozens of U.S. universities and colleges. And in perhaps among the most tragic and immoral cases, thousands of Syrians approved for refugee status in this country will no longer be welcome. Coming on Holocaust Remembrance Day, the executive order ignited a storm of reaction and protest. Arriving lawful permanent residents, pre-cleared refugees, tourists and others were detained and subjected to questioning about their political and religious beliefs. Dozens of volunteer lawyers and thousands of demonstrators flocked to international airports in major U.S. cities to provide support and legal representation to people being detained on arrival. In Chicago, Congresswoman Jan Schakowsky went to O’Hare to argue (successfully) for the release of constituents and their relatives. 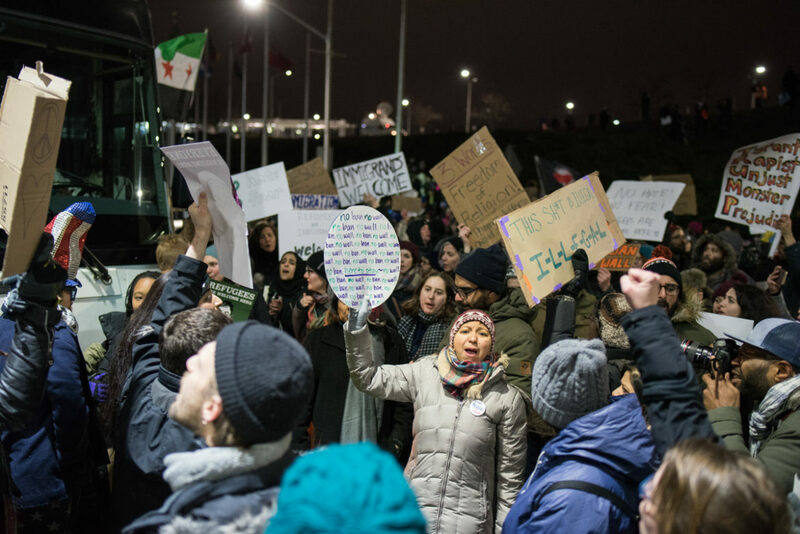 A federal court in Brooklyn, New York, temporarily halted the executive order. The White House back-tracked and announced that the order was not meant to apply en masse to returning green card holders, but then reversed itself. At this writing, the ultimate authority and impact of the executive order is still unknown. In the years since Chae Chan Ping, the “plenary power” rule over admissions and racially biased immigration policy has been somewhat but not entirely eroded. By 1907, Congress barred almost all immigration from Asia, a ban not lifted until the mid-20th century. For Jewish families from Europe like my own, founded by pre-World War I immigrants, Congress passed more exclusionary laws in the 1920s based on racist, anti-Semitic and anti-Catholic politics. My grandparents could not rescue their brothers and sisters, parents or cousins as the Nazis rolled across Europe in the 1930s. During the Great Depression, thousands of Mexicans were deported as scapegoats for the economic crisis, but welcomed back in the 1940s when their labor was needed for the World War II production effort. Japanese-Americans were imprisoned during that war, and some left the U.S. in disgust. After the war, Congress allowed entry of some European Jewish and non-Jewish refugees and Asian and European war brides, but refused to lift the hated racist quotas from overall immigration. It took the strength of the civil rights movement to abolish the quotas in 1965 legislation, although the “fairness” of the new system masked a new form of discrimination against lawful immigration from Mexico. In the decades since, several generations of Americans from baby boomers to millennials have organized to denounce unfair immigration policies. In the 1970s and ’80s Mexican immigrants demonstrated and worked with civil rights lawyers to halt some of the worst raids abuses and racial profiling in major cities. In the 1980s, Reagan administration refusal of political asylum to Central Americans met a vigorous response from the Sanctuary movement, organized by refugees, religious communities and lawyers, who succeeded in protecting over half a million Salvadoran and Guatemalan refugees through civil disobedience, humanitarian aid, individual case representation and class-action litigation. After 9/11 when Muslim immigrants were summoned for questioning and arrested, civil liberties organizations and ordinary people protested racist, unfounded so-called security measures. Of the thousands of Middle Easterners called in for questioning in the George W. Bush-era NSEERS program, not one of them was discovered to have participated in any terrorism-related crimes. And it is the children of the U.S. citizens, immigrants and refugees of those past generations who turned out in the hundreds at O’Hare and airports across the country on a winter weekend to protect their Muslim brothers and sisters. This administration launched its anti-Muslim executive order and other policy initiatives against immigrants based on racism, arrogance, over-reaching and scare tactics. The public outcry and preliminary legal success were not what the White House anticipated. Some executive orders or new laws may succeed in reinstating racialized unfair immigration policies, but the opposition will defeat others. The immigrants, asylum seekers, their allies and lawyers are acting with a deep understanding of the struggle for civil rights and human rights that precedes this latest offense to morality, justice and common decency. They have only just begun to fight.